why pivot points are so enticing? With pivot points, traders typically use the same method for calculating them. pivot points are especially useful to short-term traders who are looking to take advantage of small price movements. Just like normal support and resistance levels, traders can choose to trade the bounce or the break of these levels. Range-bound traders use pivot points to identify reversal points. 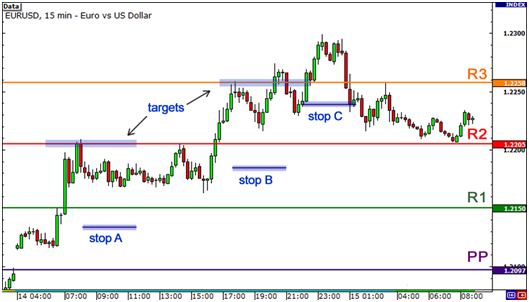 They see pivot points as areas where they can place their buy or sell orders. Breakout traders use pivot points to recognize key levels that need to be broken for a move to be classified as a real deal breakout. As you can see here, horizontal support and resistance levels are placed on your chart. And look – they’re marked out nicely for you! How convenient is that?! How to Calculate Pivot Points? The pivot point and associated support and resistance levels are calculated by using the last trading session’s open, high, low, and close. Since TRADE is as the previous day’s close.